New anticoagulants are being introduced into the market. These drugs are orally administered, have predictable pharmacokinetics and dose response, do not require monitoring and have an acceptable safety profile when used appropriately, and so avoid many of the disadvantages and possible complications of warfarin and heparin. Dabigatran is the most widely used, and has been approved by the Therapeutic Goods Administration. The use of dabigatran will likely increase in the coming years, and so it is important for dentists to be aware of its mechanism of action, the possible complications, and how to reverse the bleeding if it occurs. 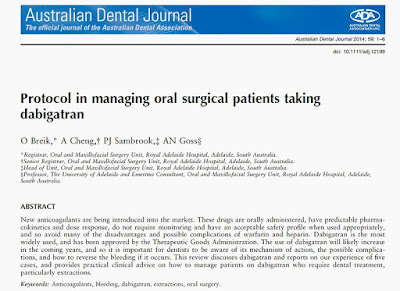 This review discusses dabigatran and reports on our experience of five cases, and provides practical clinical advice on how to manage patients on dabigatran who require dental treatment, particularly extractions. *Registrar, Oral and Maxillofacial Surgery Unit, Royal Adelaide Hospital, Adelaide, South Australia. †Senior Registrar, Oral and Maxillofacial Surgery Unit, Royal Adelaide Hospital, Adelaide, South Australia. ‡Head of Unit, Oral and Maxillofacial Surgery Unit, Royal Adelaide Hospital, Adelaide, South Australia.